This program will be presented in Japanese with English translation. Experience & learn about the classical Japanese theater of Noh with Kinue Oshima, the first female Noh actor from the Kita School, and her brother Teruhisa Oshima who is also an acclaimed Kita School Noh actor. 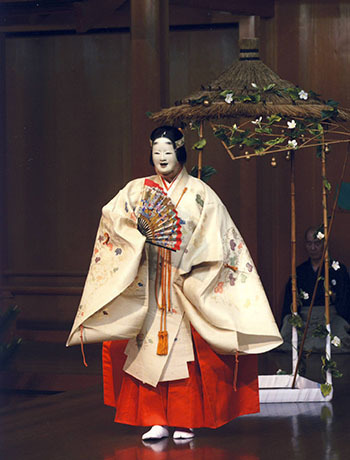 A full costume performance of “Hashitomi", a Noh play based on the character Yugao (Moonflower) from The Tale of Genji, combined with demonstrations will provide both insight and enjoyment. The program will include a music & dance excerpt from “Tadanori” and a lecture about the various performance elements of Noh. Near the end of the period of summer ascetic training, called Ango or Geango (cloistering himself for seated meditation for ninety days), a Buddhist monk living in Unrin-in Temple in Kitayama, Kyoto, prays to console the spirits of flowers offered to Buddha every day. At dusk a woman appears and offers a white flower. When the monk asks the name of the exceptionally beautiful flower, the woman answers that it is a moonflower. Pressing on, he asks the woman’s name, she says that her identity will soon be revealed even she does not give her name. Further, the woman says she came from the shadow of this flower and lives somewhere near Gojō in Kyoto. Leaving these words, she disappears in the moonflower. After listening to the tale of the love affair between Hikaru Genji and Lady Yūgao (Moonflower) from a villager, the monk visits the Gojō area, following the woman’s story. When the monk visits this place, there is a lonely-looking house just as in the past, with hinged half wall grilles entangled with blooming moonflowers. When the monk tries to console Lady Yūgao’s soul, the one who appears by opening up the hinged half wall grille is the ghost of Lady Yūgao. She narrates the memory of her love for Hikaru Genji and dances. Lady Yūgao repeatedly begs the monk to console her soul and returns inside the hinged half wall grille before the break of day. It was all a dream the monk had. Everything happens in the monk’s dream. The registration for this event is full and we will not accept wait list requests. A limited number of "rush" registrations will be available through Eventbrite between 4:00 PM and 6:00 PM on April 30, 2019. Please note that a registration is NOT a ticket. Seating is first-come, first-served and registration does not guarantee admission. We reserve the right to refuse entry to anyone once seating is full. Depending on seating availability on the day-of the event, we will also allow walk-in guests to be seated at 6:30 PM until completely full.